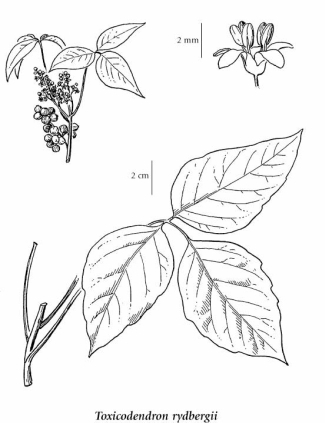 Western poison ivy is a native species that is found across the US and Canada (excluding a cluster of states in the southeastern US, Alaska, California, Nunavut, and the Northwest Territories) (USDA 2010). Disjunct populations are reported from mountaintops of the central Appalachians (McMurray 1988). In British Columbia, it may be encountered in south-central regions and particularly in the Okanagan Valley. Throughout its range, it occurs on a variety of habitats ranging from riverbanks and lakeshores at low elevations to subalpine sites. In BC, it is most often noticed along river and lake shorelines (e.g. Vaseaux Lake) where it is moderately abundant. It is a distinctive, usually erect, rhizomatous small shrub up to 2 m in height. It most often occurs as a subshrub (McMurray 1988). Branching is simple. It has three shiny, pointed leaves and numerous monecious flowers occur in dense clusters in the leaf axils. Berries are white, sometimes greenish-yellow. Leaves often appear slightly drooping and exude milky sap when broken or cut. Western poison ivy can cause dermatological reactions when touched, resulting in an itchy rash, and should not be handled. Deciduous slender shrub, decumbent to erect, ivylike, up to 2 m tall, somewhat hairy, exuding milky juice when cut. Leaflets 3, abruptly sharp-pointed or long-pointed, broadly egg-shaped, entire or shallowly crenate to lobed, 5-15 cm long. Inflorescence of crowded axillary panicles; flowers 2-3 mm long. Berrylike drupes, 4 mm long, white to greenish-yellow, glabrous. The slightly volatile oils of this plant cause an allergic reaction for some people. Dry to mesic slopes in the montane zone; infrequent in SC and SE BC, rare in SW BC; E to PQ, NB and NS and S to MX. Rhus radicans var. vulgaris (Michx.) DC. Rhus toxicodendron var. vulgaris Michx.